Only 59% of companies are expected to achieve quota in 2016, down from 67% in 2013. Technology can be your ticket to automation and efficiency, but it can also grind a sales process to a halt if adopted haphazardly. 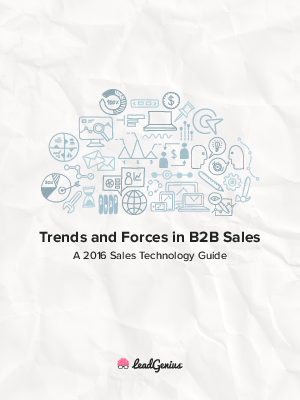 LeadGenius 2016 B2B Sales Technology Guide walks marketers through each emerging technology category that will help your revenue team gain momentum this year and beyond. High-performing B2B marketers must be up-to-date on the trends and forces shaping their counterparts in sales.